Perfect Packaging Perfect Packaging was established in the year 2012. We are the leading manufacturer and supplier of the best quality Box Strapping Rolls. Apart from this, we trade, retail and supply quality approved Container Bottle Seals, PET Strap, Polyester Composite Strap, Steel Strap, Woven Lashing Strap, Pneumatic Coil Nailers, Plastic Stretch Wrapping Film, Silicone Sealant, Bag Sealing Machine, Bag Closer Machine, Strapping Dispensers, EPE Foam Roll, Plastic Pallets, Plastic Tree Guard, Air Bubble Roll, Masking Tapes, Wire Mesh, BOPP Self Adhesive Tapes, PP Bags. These products are manufactured by our qualified and certified team of experts, who fabricate these products using premium quality of raw material in our high-tech manufacturing unit. These machines have found wide applications in packaging various products and items in an efficient manner. Our clients appreciate these machines for their significant features like easy operations, high efficiency, optimum performance and corrosion resistance. Clarity, glossy finish, puncture resistance and optical qualities are few attributes of our offered range of packaging material. The business operations are handled by experienced management led by our Propreitor, “Mr. Hussain Marketwala”, who has with him extensive experience in the field of industrial packaging tools. His visionary guidance as well as consistent support provided to the processes has helped our team to precision handle the involved operations. We are Perfect Packaging Is One Of the Leading Suppliers & Traders of Container Bottle Seals, PET Strap, Polyester Composite Strap, Steel Strap, Woven Lashing Strap, Pneumatic Coil Nailers, Plastic Stretch Wrapping Film, Silicone Sealant, Bag Sealing Machine, Bag Closer Machine, Strapping Dispensers, EPE Foam Roll, Plastic Pallets, Plastic Tree Guard, Air Bubble Roll, Masking Tapes, Wire Mesh, BOPP Self Adhesive Tapes, PP Bags In Ahmedabad. We Are Perfect Packaging one of Leading Traders & Suppliers of Strapping Dispensers, EPE Foam Roll, Plastic Pallets, Plastic Tree Guard, Air Bubble Roll, Masking Tapes, Wire Mesh, BOPP Self Adhesive Tapes, PP Bags in Ahmedabad. We offer Heavy Duty Plastic Strap Tensioner at reasonable rates. It is used to Strap Plastic Strap or Lashing Belt or Pet Strap. It can strap any sizes from 12 mm to 50 mm. 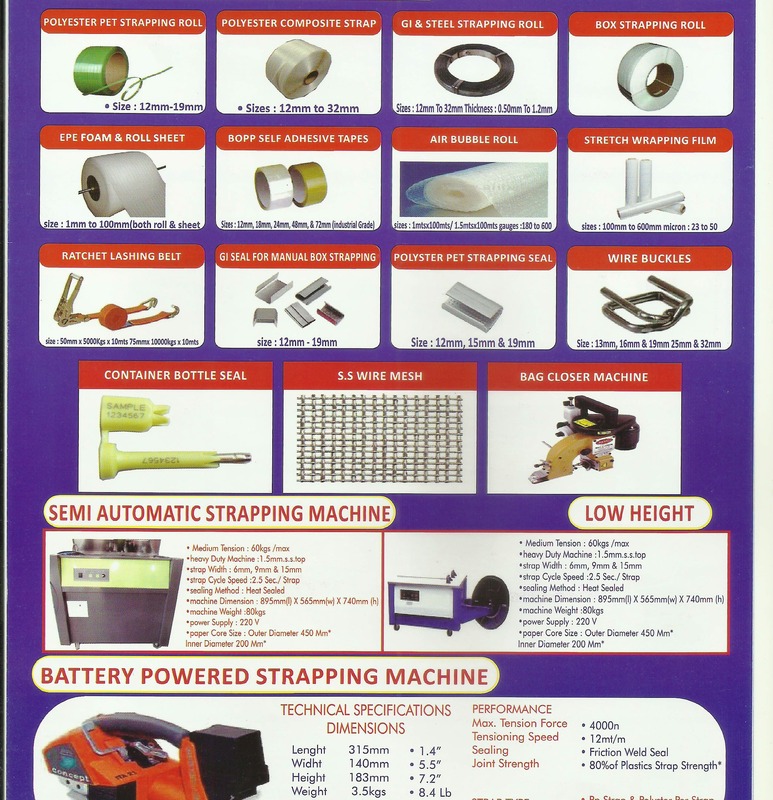 We offer Good Quality Strapping Tensioner at reasonable rates used for strapping Plastic Strap or Pet Strap. It is used to strap any Plastic Strap from 9 mm to 19 mm. Make in Taiwan. We offer Heavy Duty Bag Sealing Machine 12 Inch and 2 Parellel Lines at reasonable Rates. It can seal any Plastic Bags upto 12 Inch. It is mainly used for packing Plastic Bags in Snacks and Textile application. We perfect Packaging Is Leading Suppliers of Croc Seals One Time Lock Seals for Plastic Tags in Ahmedabad. We offer Bag Closer Machines at reasonable rates. 3 months warranty on Motor only. It is used to stitch Plastic Gunny Bags or Gunny Bags.